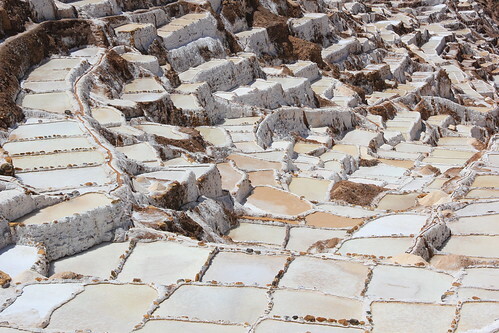 These salt pans are just a few hours outside of Cuzco in Peru near a tiny village called Moras. An underground spring pours saltwater down the hills into the “pans” that locals have created. As the water evaporates, huge salt crystals remain. This particular area provides Peru with nearly 80% of its salt! The pools are all at different levels of evaporation, which accounts for the patchwork of colors. There’s no real perspective in this photo, but the area is huge!